Try to reserve an hour or two of distraction-free time every day to work on this course. Acquaint yourself early with all the assigned readings and viewings. Check the schedule often. Make sure to read very carefully 1) “The Farthest Channel,” 2) “Is Google Making Us Stupid?,” and 3) “So Much Woman.” We’ll be looking at these three texts on numerous occasions throughout the course. Group work is crucial to the classroom learning process and to your participation mark. Students who read the assigned material for the first time in class will lower the quality of group learning. 1. Your rhetorical analysis is due at the start of class, Week 5. Get on it right away. 2. Your evaluative analysis will be written in class, Week 10. Start ASAP watching Mad Men and reading Cox. As you watch the show, ask yourself, Is Cox right? Why or why not? Viewing requirements: Season One plus “The Mountain King” (S2 E12) and “The Summer Man” (S4 E8). 3. Your research paper is due Week 14. Look ASAP at the topics under Week 14 and at Research, especially the sub-section, “Things to Remember for Essay #3." Feel free to discuss your topic with me — or show me an outline — at any time. Do as much preliminary research as you can. The biggest problem students have is summarizing, observing, and asserting when they should be analyzing and arguing. If you’re repeating content, explaining something that’s obvious to an educated reader, or asserting something without giving the reason why what you’re saying is true, then you’re not making an argument. Reading or Viewing in bold = text to read or video to view — before class! There are no required readings for the first class. We’ll go over the course site and then practice rhetorical analysis on a clip from a TV show, a lyric, and the opening credits of a movie. Also look at the rhetorical analysis of a Proctor & Gamble ad, a Taylor Swift video, a Coke ad, a Budweiser ad, a Macklemore & Ryan Lewis video, and videos on How to Write Essays and Research Papers More Quickly, rhetorical analysis, strategies, 7 strategies, devices, and analysis. I suggest thinking about Atwood’s use of comparison in CP “Canadians: What Do They Want?” and in the sample essay “The Bristling North” (in Rhetorical Analysis Samples). N.B. (short for Nota Bene, Latin for “Note Well”): Douglas College has all sorts of help for writers. You might start with the Learning Centre’s tutorial help, grammar resources and handouts, and PDF on the academic essay. For citation and bibliographical information, see Purdue University’s OWL (Online Writing Lab). You could start at “Research and Citation Resources.” The University of Richmond has an extensive user-friendly site, which covers a wide range of topics, including writing in other disciplines. The University of Wisconsin also has an excellent handbook. There are only two short readings required for class this week. This will give you time to work on your first essay and to read 1. Outline, 2. The Academic Essay, and 3. Rhetoric and Rhetorical Analysis Samples. Reading + group work on "A Wonderful Book" (Mark Twain). You’ll develop a statement explaining the structure of Twain’s text. Note that group work will usually consist of three components: 1) discussion — in small groups, 2) boardwork — using graphics and writing a thesis statement or scratch outline, and 3) explaining your work to other groups. Reading + group work on “Ships in the Desert” (a short essay by Al Gore). In class we’ll examine Mad Men opening credits, Simpson's parody, split-screen comparative version, the sample essay on the opening credits (in Rhetorical Analysis Samples), and the final scene of "The Phantom" (S5 E13), which contains the song "You Only Live Twice" (lyrics for the song are in Mad Men Notes). In class we’ll compare the rhetoric in two trailers for Men, Women, and Children - MWC 1 - MWC 2. We’ll also analyze rhetoric in the 10-minute Amritsar Massacre sequence in Gandhi, and then look at the sample rhetorical analysis essay in Gandhi. If time permits, we'll also practice rhetorical analysis on various clips. Reading + group work on “Is Google Making Us Stupid?” (Carr, CP). You’ll construct an argument explaining Carr's use of time and metaphor. How does Carr connect his historical references to the present? How does he use metaphor to make his point? As an introduction to the Gandhi clip, I’ll touch on the larger course theme of democratization. 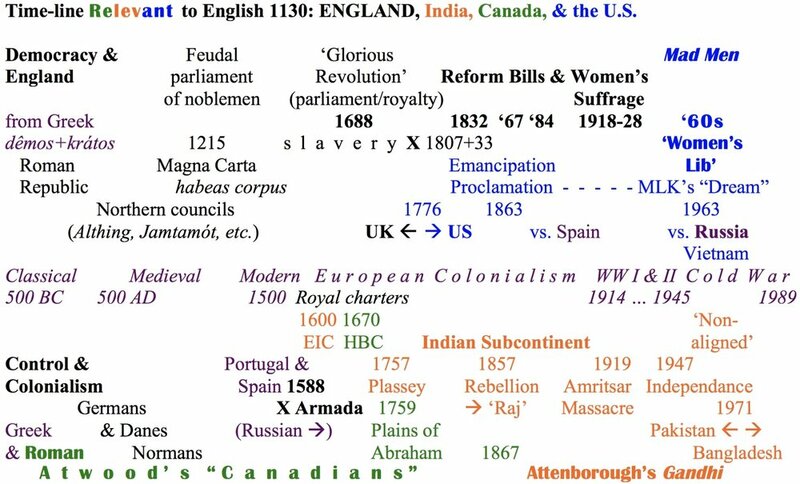 I’ll suggest that the notion of rhetorical structure can be seen in many things — even in the historical context of an English course. Chronological charts are particularly helpful at visualizing complex structures. Here's a chart that gets at some key moments in the history of human communication technology. What would you add to this chart? What did Carr include and what did he leave out? Why? Reading + Group work on "The Farthest Channel" (Italo Calvino). You’ll work in groups on a scratch outline that makes an argument about the way Calvino structures his text. This is a challenging text, with several layers that are relevant to this course. Viewing + group work on "Smoke Gets in Your Eyes" (S1 E1), written by Matthew Weiner, directed by Alan Taylor. In groups, you’ll construct an argument about this episode based on its structure. You can come up with whatever argument you want, or you can come up with an argument on 1) the relation of the opening credits to the first episode, 2) the way space or setting determines or reflects the predicament of a character or the complexity of an issue, 3) feminism, 4) the way the director makes us aware of the historical situation in 1960. Your thesis should go something like, “Taylor suggests ___ by ___________ .” The trick here is to express the director’s aim in a brief way, so that you can focus in more detail on the way he uses a strategy or a combination of strategies. The goal is to fill the second blank with a strategy or a combination of strategies, a large number of which you can find in the 16 Categories in Rhetoric. I suggest watching the episode once for overall understanding, and then watching it again to understand its rhetoric. The scratch outline is a requirement of this essay, yet it should also help you see the structure of your argument — especially how your thesis statement is connected to your topic sentences. - Make arguments that are structured according to the standard academic essay format – that is, with a thesis statement and topic sentences. To do this well, you must understand what an outline is. - Make arguments that aren’t summaries or observations. - Make arguments that don't confuse summary with rhetoric, or rhetoric with evaluation. This site will help you cite sources and create bibliographies — which will become increasingly important in this course. Remember that you don't need to cite the Youtube video itself. Essay # 1 (25%) is due at the start of class. After you hand in your papers, I'll give an introduction to the evaluation section of the course. Because you have an essay due, you don't have to have any of the evaluation readings done for this class. See the Essay Instructions below. Viewing: this clip from Mona Lisa Smile (2003) and this second clip. How are Postman’s ideas helpful in understanding these clips, which deal with some of the dilemmas women faced in 1953/4. Note that this is roughly the time many of Mad Men’s women were adolescents and young adults. If you can find time, watch the whole film (it’s an easy watch and it’s on Netflix) and compare the societal pressures and life options faced by the two Betties (played by Kirsten Dunst in MLS and Elizabeth Moss in MM) and the two Joans (Julia Stiles in MLS and Christina Hendricks in MM). How free are they to choose their futures? The essay must be typed, double-spaced, and no more than 650 words. Late essays will be docked 5% per day. Essays longer than 650 words will be marked down. Write a rhetorical analysis on one of the choices below. For several of these, you can opt to compare trailers. This option is indicated by “and/or.” Check to make sure you’re watching the trailer that is listed below; often there are different versions, and you want to be sure that the item you wrote on is the one I’m thinking of when I mark your paper. For this reason I’ve included the full address. You must include a scratch outline (125-225 words) at the start of the paper. 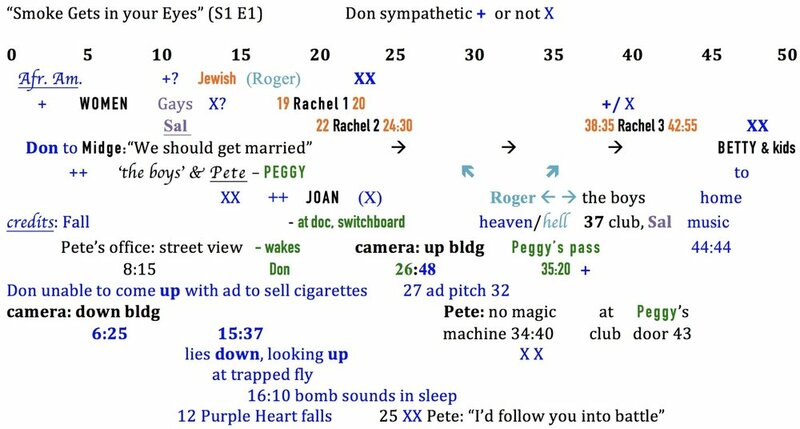 See the scratch outline samples on the opening credits of Mad Men (in Rhetorical Analysis Samples) and Lord of War (rhetoric sample). Don’t use a cover page or folder. Simply put your full name in the top right hand corner of all pages (i.e. Roger Clark – 1) and staple the pages together. Provide word counts for both the outline and the essay (as in the Mad Men sample). Items on Netflix are marked with an N, Amazon Prime with AP. The essay is short, so I suggest writing a very short introduction and don’t repeat yourself in your conclusion. If you end the body of your essay on a final or concluding note, you don’t need a conclusion. The sample essays on Mad Men and Moulin Rouge! both end this way. You don’t need to provide a bibliography or cite the credits or trailers. You’re not required to use other sources (articles, books, etc. ), yet if you do, cite them according to MLA or APA format. For bibliographical information and format, see Purdue University’s OWL site and “Research and Citation” (screen grab below).